In 2003, the American Academy of Pediatrics partnered with national child care and health organizations to build on the achievements of two successful campaigns: The Back to Sleep Campaign and the Healthy Child Care America Campaign. 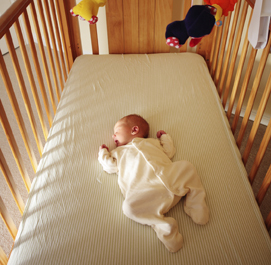 This effort, known as the Healthy Child Care America Back to Sleep Campaign, aimed to promote the health and safety of infants in child care settings by providing education and outreach to child care providers regarding safe sleep recommendations. Support states to enhance existing and establish new child care regulations. As part of the Healthy Child Care America Back to Sleep Campaign, the AAP developed an educational training program for child care health consultants and other trainers of child care providers that included a Speaker’s Kit and other training materials, a discussion forum, and an online training log.